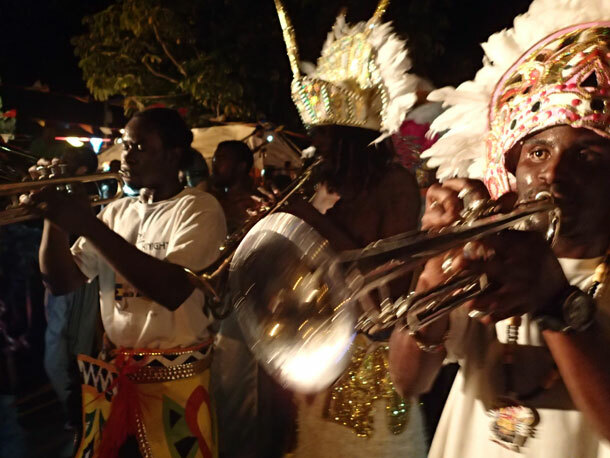 It is time to party Family Island style in the Bahamas! Down the street from our marina we can hear dance music booming out over a loud speaker. 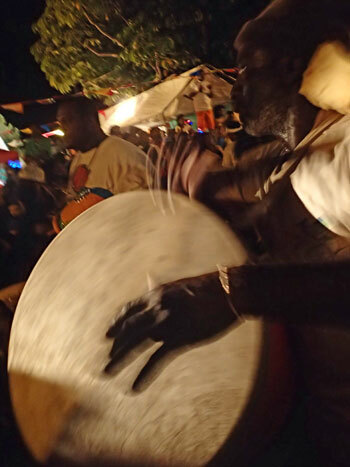 Itâ€™s the rhythm of Biminiâ€™s Homecoming celebration. 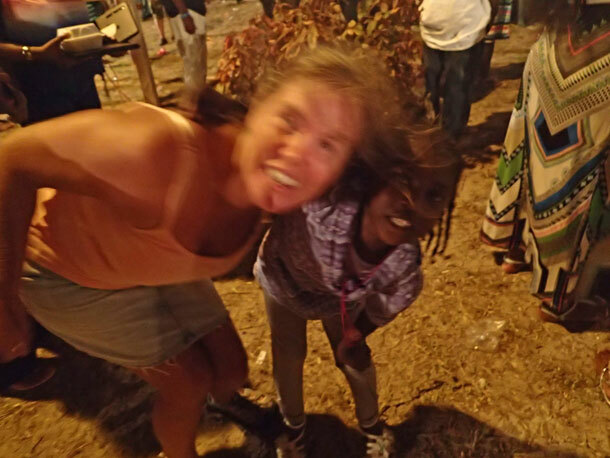 Bahamians from all over this multitudinous island nation have returned home, swelling this small isleâ€™s population for a weekend of eating, drinking, dancing, and re-twining the bonds of friendship and family. 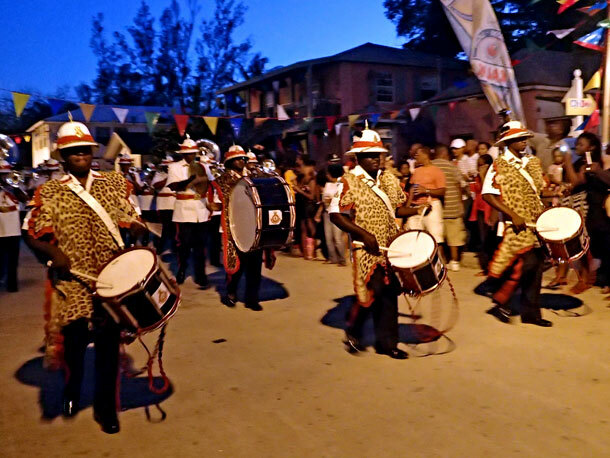 Homecomings are celebrated throughout the year in different settlements all over the Bahamas with food, music, Junkanoo, and sometimes a regatta. 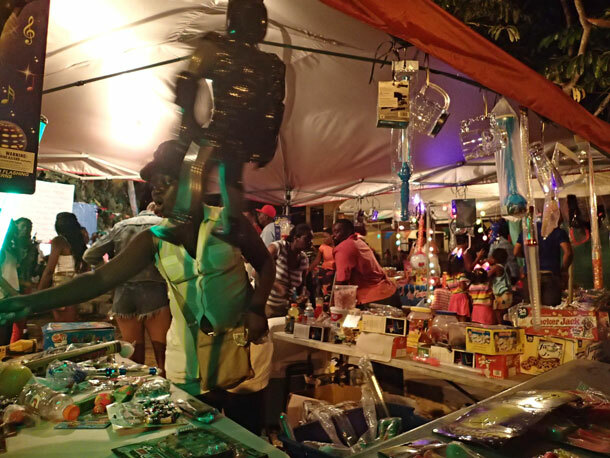 It is an annual event where Bahamians who have left their hometowns for Nassau or other big cities return home and reconnect with those they left behind and others who also left to find their fortunes elsewhere. Next a comedian told jokes and reminisced about growing up in Bimini. 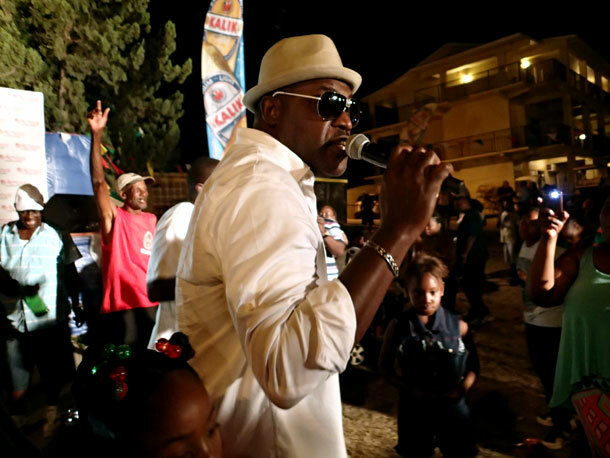 He touted the main attraction, a singer named Stileet from Inagua, throughout his act. The crowd was geared up. It was time for the music. Stileet! But, no Stileet appeared. The comedian stalled, he invited children up on the stage to dance, interviewed visitors from other countries and held impromptu contests. We waited. Then finally with no fanfare (maybe I wasnâ€™t paying attention) a guy gets up on stage and starts to sing. Was this the guy? I wasnâ€™t sure, but I was sure I was disappointed after such a long wait. Stileet was not my thing. It had been a long day anyways, and it was time for us to finally get some sleep. 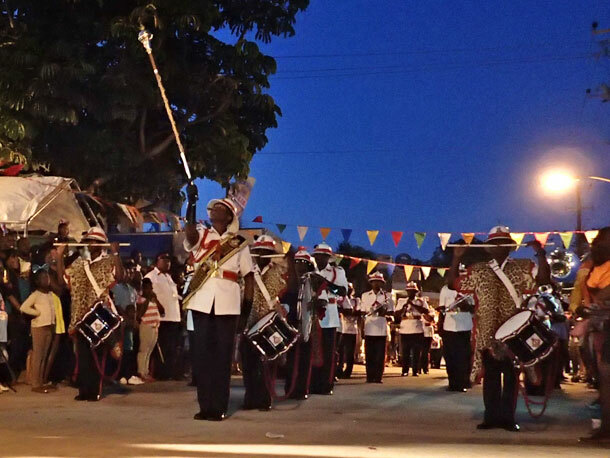 The Royal Bahamian Police Force Band and Junkanoo were scheduled for the next day. We were told this was the big day! We didnâ€™t want to miss the Police Force Band so we asked around as to what time they would be performing. Evening was the best response we could get. We didnâ€™t want to hang out at the festival grounds all day so we decided to head back to the boat and come back out later. After dinner, as we relaxed on Blue Wing, with music from the festival grounds blaring in the background, when we noticed the tunes suddenly stop. Then came the yelling. Oh! Itâ€™s the MC. We got it. The entertainment starts when the yelling starts! We headed for the festival grounds. The MC bantered with the crowd, stopped passing cars and generally made a spectacle of himself in the middle of the street. He announced that the Police Force Band would be starting at 8:00 sharp. Sharp? Really? 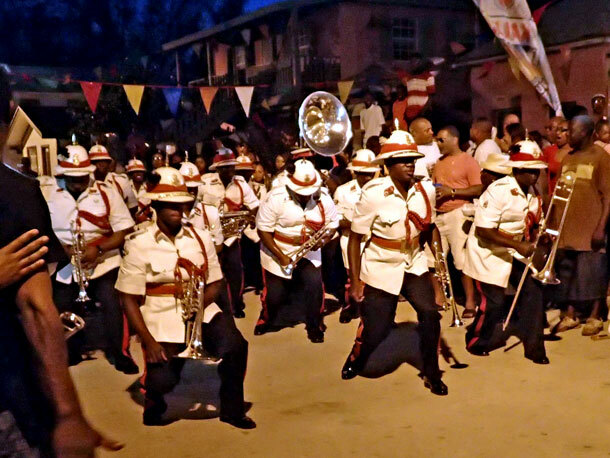 Yes, this is the Royal Bahamas Police Force Band and these men and women are sharp! They marched down the street in crisp uniforms of white jackets, dark pants and pith helmets all trimmed in red. They didnâ€™t miss a step and their regimental footsteps were always in time. Theyâ€™d play a traditional sounding triumphant marching tune followed by a something more jazzy or lilting in a brassy way with a calypso influence. Then the marchers would break out of their more traditional routine with funky soulful shuffles and hip twisting low squats low to the ground, James Brown meets the Queenâ€™s Guard. The crowd ate it up! 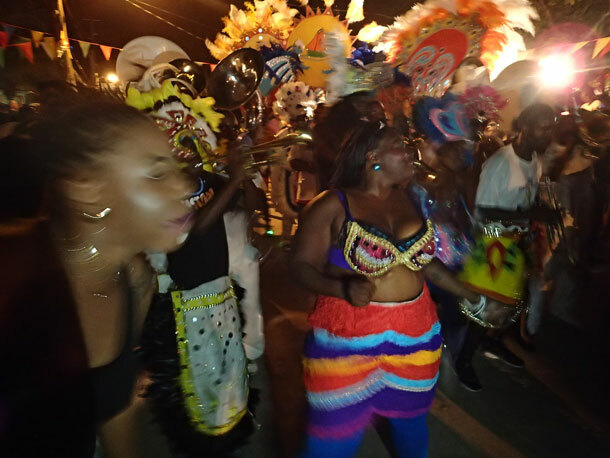 The night ended with the frenzy of Junkanoo, a colorful street parade of costumed revelers dancing to the rhythms of cowbells, goatskin drums, and whistles, accompanied by brass instruments. I think the pictures can describe the scene better than I can. The next morning, Easter Sunday, we were awoken to a rambling sermon coming from the festival grounds over the loud speaker. If Bimini was dead from the party the night before, they were now resurrected. 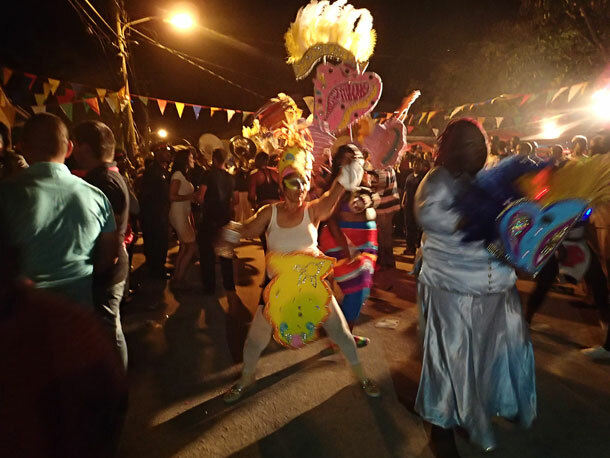 After talking to a local a few days later, we got the impression that maybe our Sunday morning wake up was not another facet of the festival, but eccentricity of a local character. 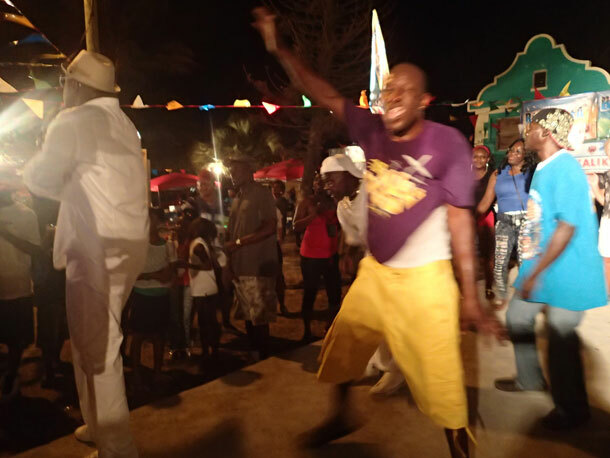 Sunday, the last day of the festival, there was a party on the beach in the afternoon. But with the beach on the other side of the island we couldnâ€™t hear the sound of music or yelling to lure us from the quiet of Blue Wing. 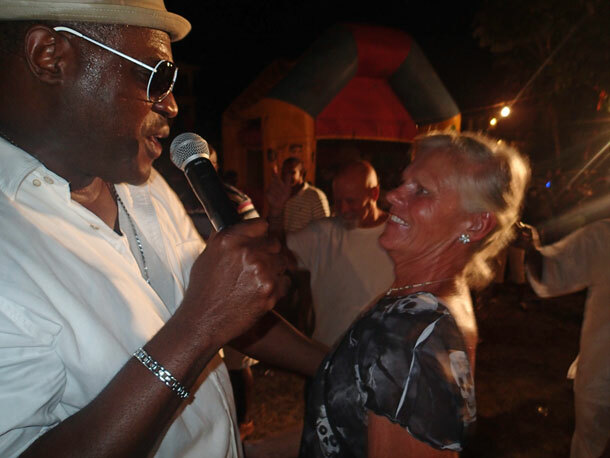 We were partied out, but jazzed up with the verve and spirit of Bimini and the Bahamas. In addition to food and drink booths there were a couple of toy and gift booths that did a booming business. This friendly little girl was fascinated by my camera. I let her take random pictures with it until her mother came to get her. Greg took this shot of the two of us. 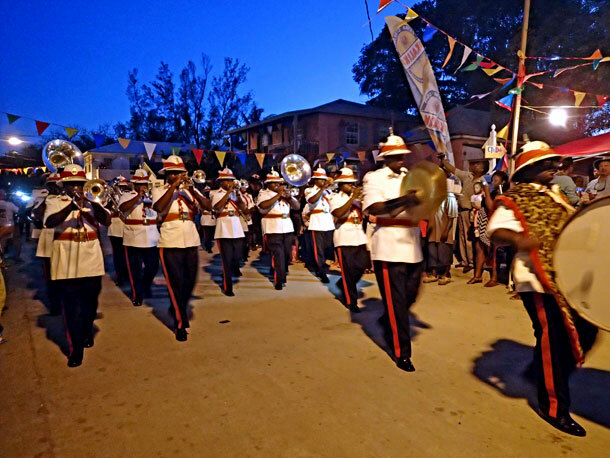 The Royal Bahamas Police Force Band. The Police Force Band drummers wear leopard skins over their uniforms. The leader of the band had six foot gold baton he swirled in the air. Getting down to Geno D.
Fellow cruiser, Teresa, getting into the music. 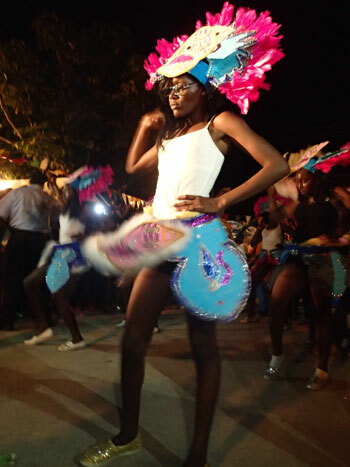 Many of the costumes represented different aspects of the Bahamas. 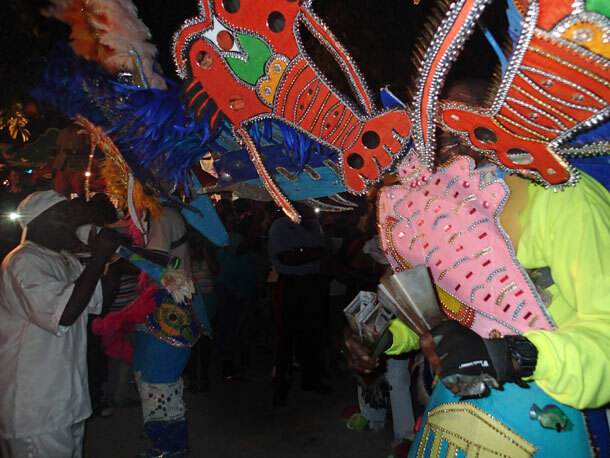 This cow bell parader is decorated in the bounty of the sea, lobster and conch.